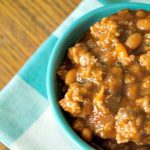 Baked beans made in your slow cooker is a classic recipe that everyone should have in their recipe repertoire. The ingredients are simple and really you can mix things up and put your own twist on this recipe by adding other yummy ingredients. I have had baked beans with pineapple, extra onion, little smokies, kielbasa, and other delicious bits added. However, this is my classic baked beans recipe. I am asked to bring a slow cooker full of these delicious beans to every family gathering. And because my family and friends love these beans so much I normally have to make a triple batch to feed everyone. And I always set aside and freeze a container just for my husband. Otherwise he is disappointed that there were no leftover baked beans for him to enjoy! 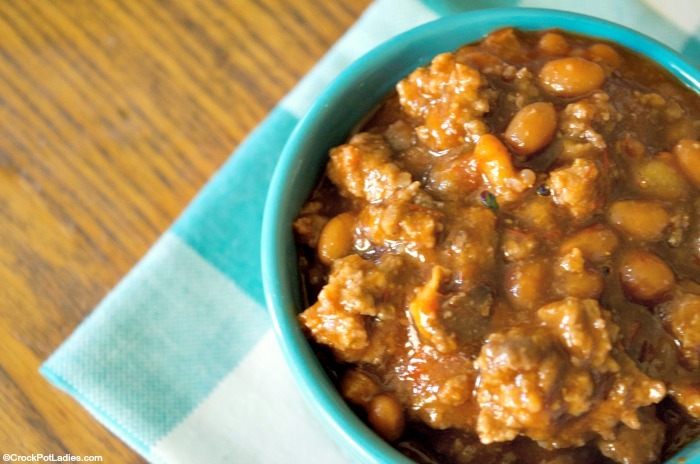 This recipe can easily be made 1 or 2 days ahead of time and when cooked stash the beans in the slow cooker with the lid in the refrigerator. Then when it is party day just pull your beans out of the fridge and warm them back up in your slow cooker. It could not get easier! I hope you enjoy this recipe as much as my family and I do! Serve these delicious baked bean at your next backyard barbecue, party or pot-luck and your guests will be begging for the recipe! 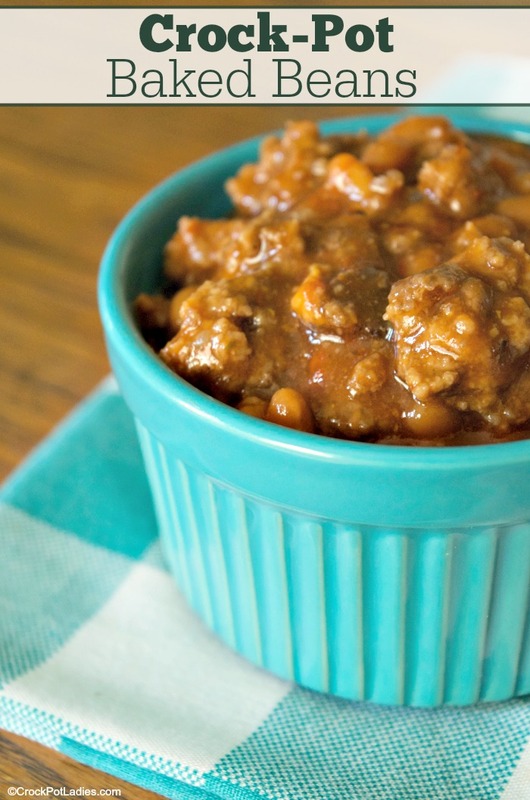 Canned baked beans are jazzed up with ground beef, onions, chili sauce, bacon and a touch of brown sugar. In a medium skillet on the stove-top, cook the bacon until crispy, drain off excess fat and let bacon drain on several layers of paper towels. Once cooled, roughly chop bacon and add to a 3 to 6 quart slow cooker. In the same skillet that you used to cook the bacon, add the ground beef and chopped onion and cook until the ground beef is browned and crumbled. Drain off excess fat and add beef and onion mixture to the slow cooker. Add remaining ingredients to the slow cooker and stir to combine.